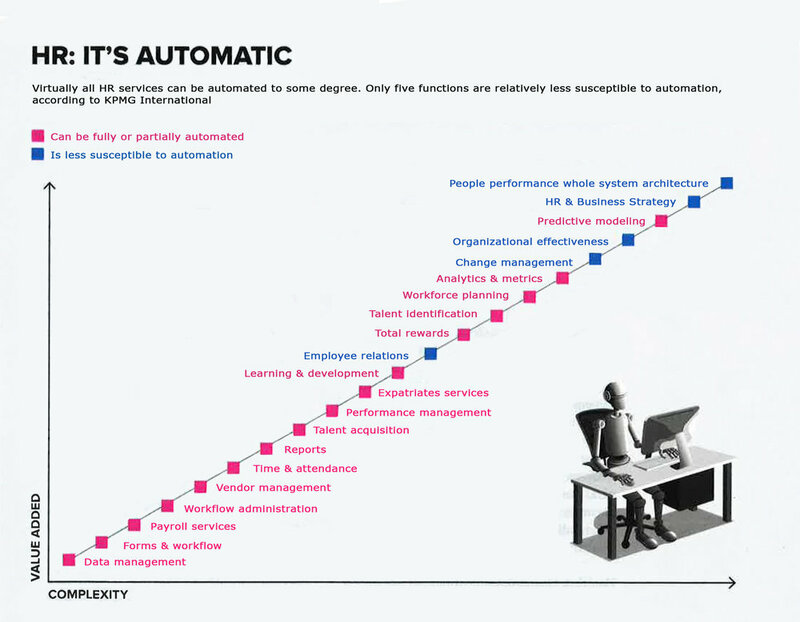 I noticed the below KPMG International chart while reading the Spring 2019 edition of HR Magazine and wondered to myself, “what are all of my friends in HR thinking about the increasing amount of technology solutions that are impacting their careers?” Are they terrified? Defensive? Afraid that they will be replaced by a machine, an app, or a platform? Or (as I would hope their reactions will be) are they possibly embracing the new normal, utilizing technological advances to create efficiencies, especially in those areas of repetitive and redundant transactions? Let’s face it: technology is disrupting many industries. The KPMG chart above could be perceived as painting a scary future where HR professionals are reduced to a select few responsibilities. Upon closer inspection, however, the chart reveals the growing need for professional HR leaders in vital areas like business strategy, organizational effectiveness and employee relations. No app will replace the importance of an HR leader’s voice in a C-suite level meeting. No bot will replace the professionalism needed during a reduction in force or a facility/office move. So, embrace the changes. Be the first one to introduce technology solutions, like artificial intelligence, into your HR practice. Rid yourself of the mundane tasks and become an important part of your organization’s overall strategy. If you believe in yourself and your ability to add value, your career will soar beyond what you ever dreamed was possible! What’s one way you are embracing and leading change within your organization?